Chris is a bird aficionado who loves to draw birds and go birdwatching. For him, drawing is a great way to learn more about things and get a new perspective on what they look like. He also keeps busy chauffering his three kids to different activities, riding bikes, and spending time with his family. 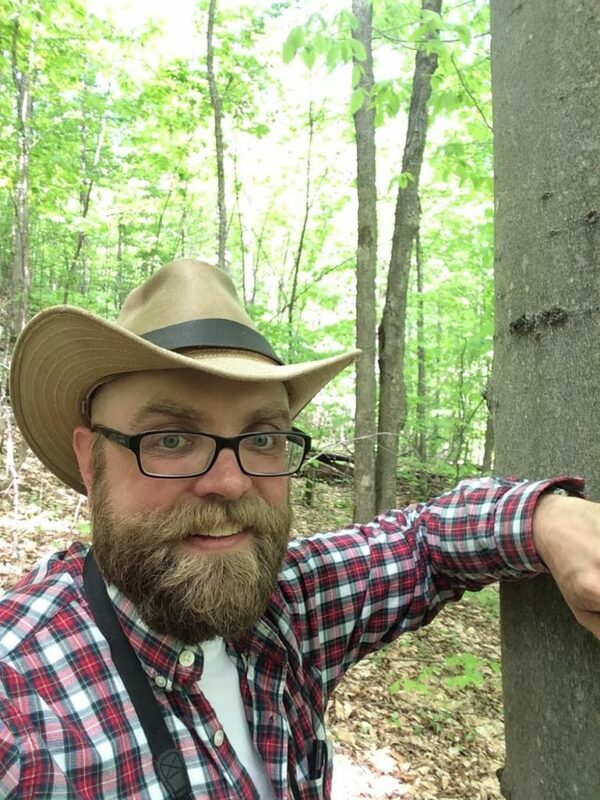 He is a community ecologist who studies biodiversity of different species, and he is interested in figuring out what animals are where in our ecosystem. In particular, his work focuses on spiders, insects, and other arthropods. Chris grew up surrounded by beautiful forests and exquisite lakes for fishing and canoeing. His dad was a high school biology teacher, and Chris recalls flipping through field guides during their family outdoor adventures. After high school, Chris started college in an engineering program and hated it. He took time off and traveled to New Zealand, a place he had been fascinated by since childhood. Upon returning, Chris decided to go back to school. Flipping through a course catalog, he stumbled upon some interesting-sounding classes in ecology and signed up. There are a lot of logistical challenges Chris faces while working in the arctic, including bad weather, shipping specimens and supplies, and dealing with mosquitoes and biting flies. He faced a different type of challenge though a few years ago when he was invited to participate in a research project on pest management for crops in East Africa. This was a major grant proposal that involved months of work and a trip to Africa to work with the scientists there. Chris invested so much in this project, and he was thrilled when they made it through the first round of review. In the end, they did not receive the grant. For the next few months, it was a struggle for Chris to get his motivation and excitement for research back. Last year, two PhD students graduated from Chris’s lab. As a supervisor, Chris finds there is something really special about seeing his students do an awesome job on their dissertation defense, get their papers published, and move on to new and exciting opportunities. These have been really proud moments for him. There is a patch of the Dempster Highway north of the Arctic Circle that is 4-5 kilometers south of where the Yukon’s border meets the Northwest Territory’s border. There, you can stand and look towards the Richardson Mountains across the most spectacular tundra you can imagine. The landscape here is breathtakingly beautiful, and Chris has taken hundreds of photos there. Every time he passes this spot on his way to do field research, he makes the students stop to enjoy the views and take more photos. In Chris’s lab, they have had fun baking-related traditions where people would bring in delicious celebratory cakes decorated as spiders. They have also eaten a lot of insects since one student always used to bring in baked goods with insects in them. The group also does a lot of fun things outside the lab together as well. You don’t have to work all the time to be successful. You can take weekends off, you can have a life, and you can have hobbies outside of your job. You can achieve work-life balance. Be curious, and follow your passions in science. Chris grew up canoeing and fishing on the beautiful lakes just north of Peterborough, Ontario (Canada), and he has always had a passion nature and biology. He pursued a degree in Ecology at the University of Guelph, and a PhD at the University of Alberta, focused on the biodiversity and community ecology of spiders in the boreal forest. After a post-doctoral position at Miami University (Oxford, Ohio), he was hired at McGill University in 2002. Since then, Chris has continued to study the biodiversity of insects and spiders, and has done research from the tops of trees to the high Arctic islands. In addition to research, Chris teaches field biology and quantitative ecology, and is an Associate Dean (Student Affairs) on his campus. Chris is deeply committed to science communication, and is always happy to share his passion for science, whether it is dispelling myths about spider bites, to discussing the use of technology in the classroom. When not working, Chris likes to spend time with his family, hang out in forests (watching birds), or go for long bike rides.